“DRC is battling to keep Ebola under control; cases are increasing at a quicker rate and the virus has spread further. “Although the outbreak is still far from the scale of the West Africa epidemic, we’re operating in an extremely complex environment and facing the very real threat of more violence and instability in the run up to the elections. “The response could be forced to slow down, or even be suspended - every time this has happened before the virus spread further. New cases of Ebola found in urban areas over the last few days show the outbreak in the Democratic Republic of Congo (DRC) is not yet under control and the next few weeks will be critical to contain the virus, Oxfam warned today. Despite a strong response, not enough is being done to help communities overcome their understandable fears and in some cases lack of knowledge about the disease. Conflict, which has plagued the eastern part of DRC for decades could also still undermine efforts to contain the latest outbreak, which has claimed ninety lives since it began on 1 August. Fear within communities is making it difficult to provide help or take action to prevent the spread of the disease – with people at times threatening those trying to help. Many people don’t know who to trust, having spent years caught up in conflict, with little response from the international community or the government. They do not understand why people are now coming in such large numbers. Jose Barahona, Oxfam’s Country Director in the DRC, said: “While the transmission rate appeared to be slowing down due to communities responding quickly to prevent the spread, these new cases in urban areas mean we’re not out of the woods yet. In big cities, people come into contact with far more people, especially in a major trading place. One neighbourhood of Beni has become a transmission hub – often with daily cases in past weeks. A woman confirmed to have the virus and the health worker treating her, have also died in the city of Butembo, a major trade hub that’s home to around 1 million people and close to the Ugandan border. There have been three cases, including one death in the town of Oicha, an area in which it is extremely dangerous to work due to the presence of armed rebel groups. While the virus is thought to be under control here, there have been significant attacks by armed groups on army positions around Beni town in recent weeks, including one this Sunday. Oxfam is also concerned that fear is making some members of the community take huge health risks by avoiding taking sick family-members to Ebola treatment centers, because they see them as ‘prisons’ or ‘places of death’. A significant number of people who have been in touch with someone contagious have fled their homes and in some cases, people are resisting handing over bodies of their deceased loved ones, making the threat of the virus spreading much more acute. In Mangina, the epicentre of the outbreak where over 80 percent of fatalities have occurred, Oxfam found people in shock and angry that family members have died so quickly and are being taken away from them. Whilst the majority of people were aware of the seriousness of the virus and have been making great efforts to break the chain of contamination, those who didn’t know about Ebola, were scared and had heard many rumours. Amongst the daily incidents of low-level violence, Oxfam staff heard of some instances where fear had resulted in aid workers being threatened by angry people brandishing machetes and wooden sticks, rocks being thrown at cars, and health workers being blamed for ‘killing’ family members. In one village, part of a health-screening checkpoint was burnt down and Oxfam staff witnessed residents of another village create a roadblock, preventing any help from getting through. Oxfam is already helping over 138,000 people, by providing clean, safe water and working with local community leaders and volunteers to increase understanding of how to prevent Ebola, to dispel any myths and fears people have. Barahona said: “From working on previous Ebola outbreaks, it is clear that talking with communities and finding safe solutions with them is critical to containing the virus. When people are informed, and time is taken to listen to their concerns and questions, their behaviour changes rapidly. We have to work with people to change their understanding and behaviour if we hope to keep Ebola under control. Spokespeople are available in the region and in Ireland. “I have been working as a nurse for over ten years. I already knew of the disease before it arrived here, I knew it was very contagious. As soon as we saw the signs of the disease and the laboratory results, we reported the cases. I have reported ten cases since the beginning of the outbreak. After this incident, when the community was well informed, they apologized and regretted what happened. Louise is a community leader (deputy chief) in a district within Mangina, the most affected area by the Ebola virus. “At first we thought Ebola was witchcraft. We thought it was a spell cast on women because they are the one who are most affected. But since we received an explanation, we have understood that it is a very serious disease that strikes us. Many women have died here in Mangina, at least 20 women, they are almost all from the same family. It must be said that in our community, it is the women who tend to the sick people, they also clean them, and wash the clothes. 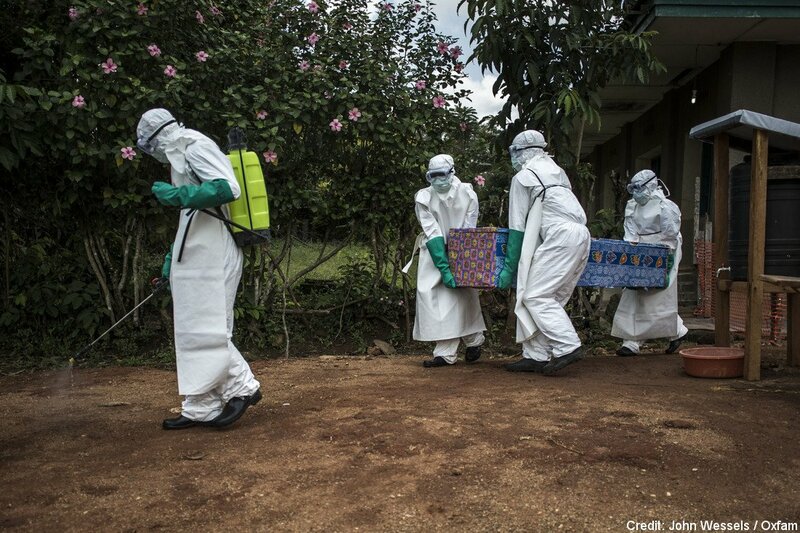 “Since the Ebola outbreak many people have died, others are in the hospital. Many children are without their mothers. These children live with difficulty and the community has few means to help them. Here in Mangina, even finding food for your household is difficult. Sometimes you can spend the day without eating. Oxfam is launching an urgent response in Beni, North Kivu in the Democratic Republic of Congo (DRC) as four news cases of Ebola are confirmed – just nine days after a similar outbreak in the Equateur province in the western part of the country was officially declared over. Jim Clarken, Oxfam Ireland’s Chief Executive, said: “People in Beni are already facing unimaginable suffering – the province has been deeply unstable for years due to armed conflict and this instability extends to the whole country. Millions of people are in the DRC are in desperate need of humanitarian assistance due to the ongoing terror of violence and war. People are hungry and at risk of deadly disease – many have been forced to flee their homes. In Beni, Oxfam’s ongoing work is reaching thousands of displaced people and host communities with food, clean, safe water and sanitation facilities. In the Democratic Republic of Congo prolonged and recent conflicts in Ituri, North and South Kivu, the Kasaï provinces and Tanganyika have left millions of people hungry and at risk of disease. Today, almost 45,000 people will be forced to flee their homes due to conflict and persecution. But there is nothing unusual about today – the same thing will happen tomorrow and every day after that. There is no end in sight to this unprecedented displacement, and unless global political leaders take action, this is a tragedy that will continue to unfold. To mark World Refugee Day, we meet just some of the 68.5 million refugees and displaced people forced to leave their homes – and the life they once knew – behind. 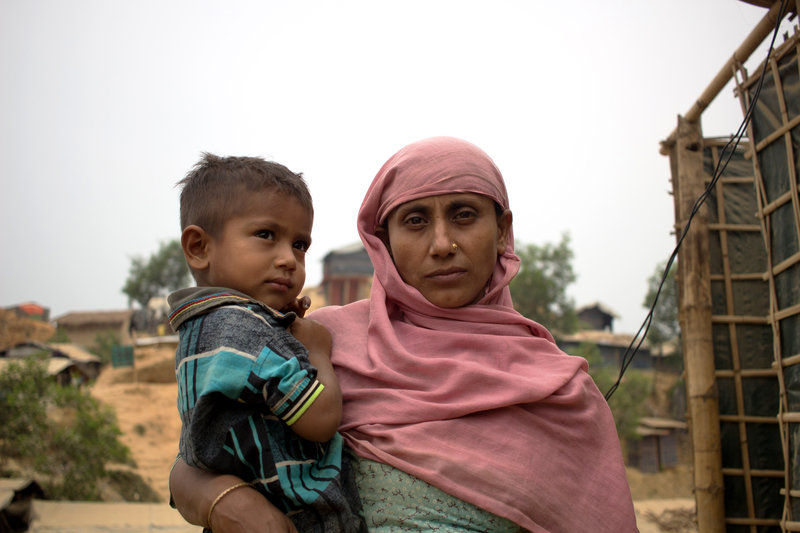 In Bangladesh, Nur* and her children live in a makeshift camp in Cox’s Bazar. They were forced to flee the violence in Myanmar, which claimed the life of Nur’s husband. 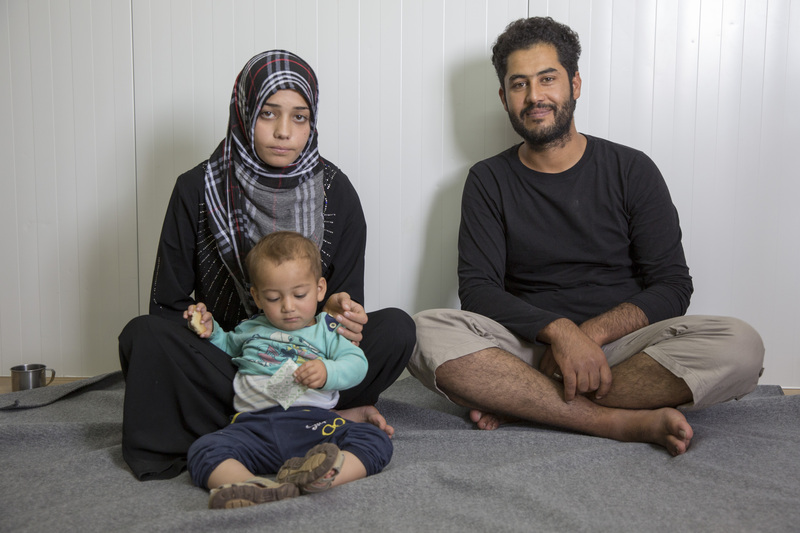 “We had to struggle such a lot for four nights and five days on our way over here,” said Nur*. “We had to starve for four days. We had to crawl over hills. “My shoulder swelled up to my neck as I had to carry my baby by fastening him with a rope. If he fell, I knew I’d lose him. “Our tears dried up, we lost our hunger. We had to go through such traumatic circumstances to reach safety. Meanwhile, Ali and Ikhlas and their young son Muhamed* are trying to adjust to their new life after fleeing the war in Syria. The young family is currently living in a camp on the Greek island of Lesvos after being saved by the coast guard. They had been en route to Italy when the sea conditions deteriorated. “We were at sea on a boat with another 47 people,” said Ali (30). “The sea got very rough. It was terrifying. My wife and my little boy were with me and I cannot swim. 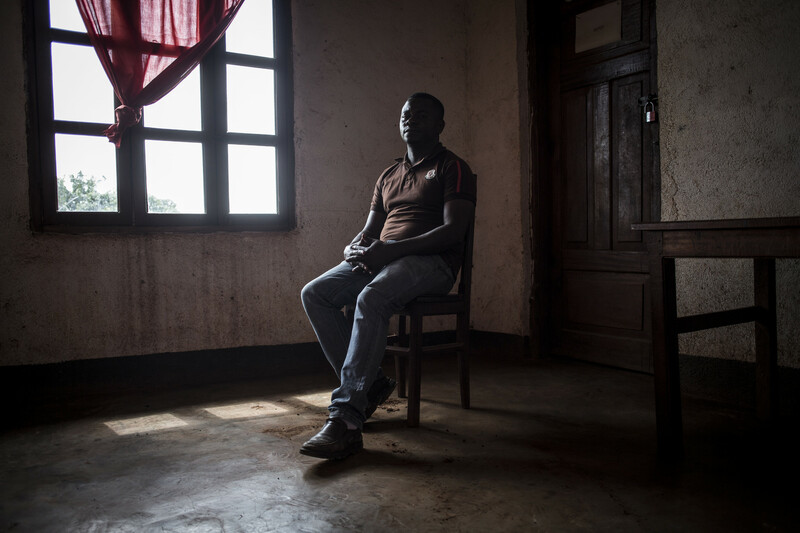 Elsewhere, in the Democratic Republic of Congo, Dieudonné* describes how he and his family were attacked by their neighbours from a nearby village. Seven people were killed during the violence, forcing the father of four and his family to seek refuge in a camp miles from home. Oxfam is working in refugee camps worldwide, providing life-saving aid including clean water, sanitation and food to those who have been forced to flee. In addition, we help to protect refugees from violence and abuse, ensure they understand their rights and give them access to free legal aid. In Kalemie province in southeast Democratic Republic of the Congo (DRC), the extreme violence between the Bantu and the Twa ethnic groups and brutal clashes between armed group have very forced more than 654,000 people to flee their homes and thousands of families are facing an increasingly critical food shortage. Women, children and the elderly are among those most affected after having seen families killed, villages burned and fields destroyed. The situation remains volatile and threatens to flare up again at any moment, preventing the displaced from going back to their villages and rebuild their lives. Oxfam has been working in Kalemie since February 2017 and has already reached 58,302 people forced from their homes and the communities who have welcomed them. Oxfam is helping to provide clean water and sanitation facilities and working with community volunteers to educate people about the importance of good hygiene for staying healthy. Left: Therese*, a Public Health Promoter talks to a child in Kalunga IDP camp, Kalemie, Tanganyika, Democratic Republic of the Congo. Right: Therese cleans Oxfam sanitation facilities in her community. Photo: Diana Zeyneb Alhindawi/Oxfam. Therese has been in the Kalunga camp since November 2016. When her village was attacked, she was separated from one of her children and her husband. Therese went looking for them after the attack but couldn't find them, and three months later she was told that their bodies had been found. Therese lives in the Kalunga camp with 9 of her children, ages 7-17 years old. She was trained by Oxfam to be a camp hygiene promoter, and she works daily to clean sanitation facilities in the camp, as well as distributing water purification tablets to families so they have safe water to drink. Therese said: "We fled as we were. There was no time to pack anything. You only took your children and ran." "We walked for two days before reaching here. I had so many thoughts in my mind. I had been left with nothing. Sometimes I wish it was me who had died instead of my husband, because this burden is too much for me to bear." "I have 9 children remaining. One of them is paralyzed and so I had to carry her all the way." "We reached here in November last year and were received well. We received food for the first two months as well as some money to help us buy other things from the shops. But how can you bring up 9 children in these conditions?" "People have been talking of going back when the fighting ends. 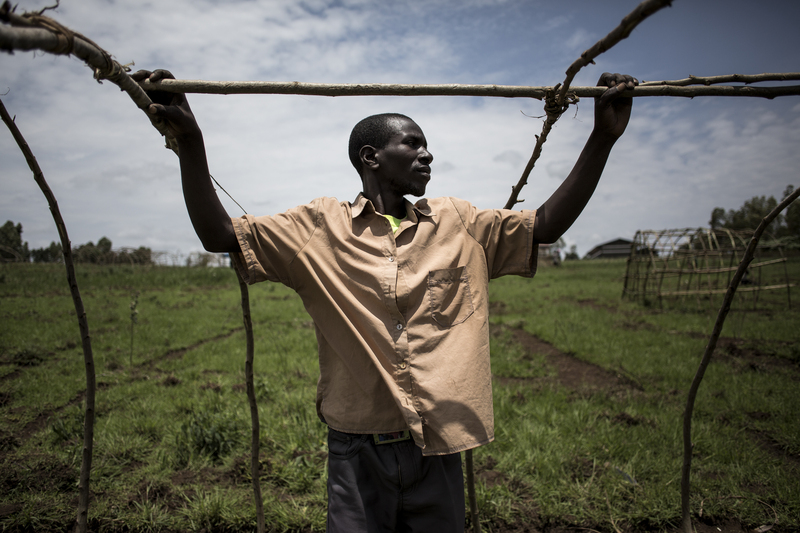 Others are even going there to check on their farms or what is left of their possessions." "I have experienced war in my life but never have I been forced to leave my home and live in a (IDP) camp. I have never seen fighting like this." "I never thought I would ever be here. My plan was to save money to build a house where my family could live comfortably and live an ordinary life. But now I can’t even think beyond today. How can I think of a good education for my children if I don’t know where their next meal will come from?" Oxfam is suppling drinking water to the people in Kalunga camp. Oxfam also trained 61 women from the camp as hygiene promoters. Their daily work includes cleaning sanitation facilities (toilets and bath areas) in the camp, distributing water purification tablets to families.